If you’re a fan of a well organized home look no further than this post where I will be sharing farmhouse organization ideas for the home!!! I am always looking for ways to organize our home! I have tried so many different ways to do it and it seems like its often a lot of trial and error!! I think finding what works best tends to err on the simple side for me!! I appreciate pretty bins and baskets because I can hide some of the unsightly items inside them! I like things to look uniform so bins and baskets tend to help me accomplish this without having to hide things in the back corner of my closet!!! So lets dive in to these 8 simple home organization ideas shall we?! *Please note this post contains affiliate links. 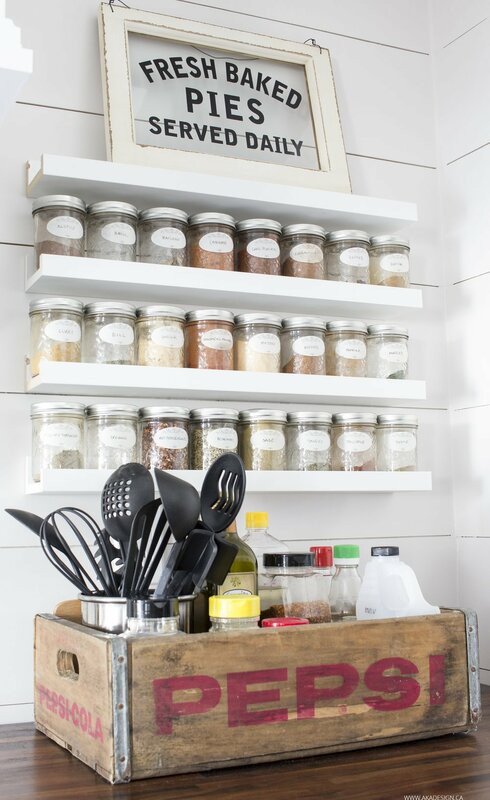 I am in love with this simple pantry organization from Cherished Bliss you will have to click over to see the other side its just as satisfyingly pretty and organized as the left side! I love this pantry because lets be honest a massive walk in pantry is not the reality for many of us! My own pantry is about a 3rd of this pantry size so I can relate to the struggle that is trying to organize a smaller pantry space. 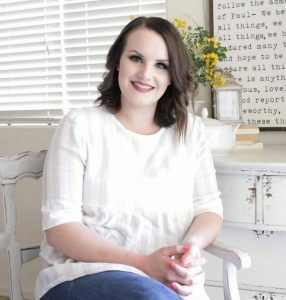 I think Ashley has done a phenomenal job of organizing this space while also setting realistic expectations for us who are hoping to achieve the same look! 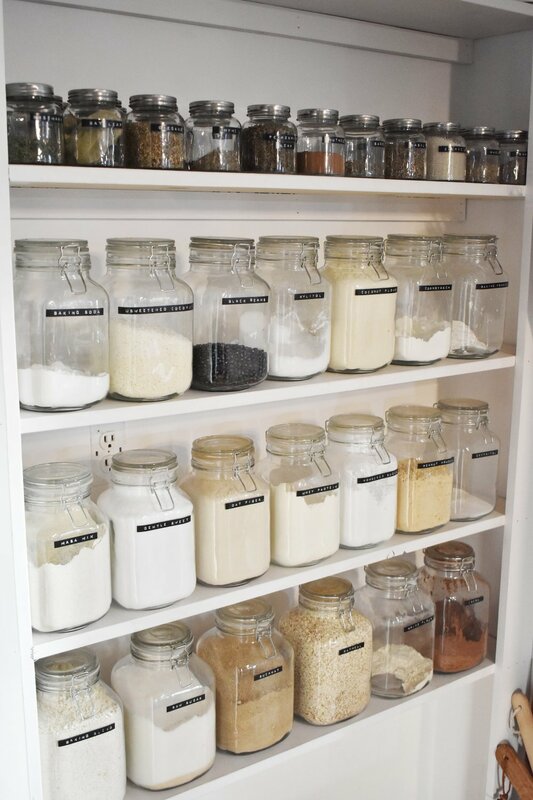 Sarah at Flat Creek Farmhouse is also shared an excellent and affordable way to organize your pantries as well! 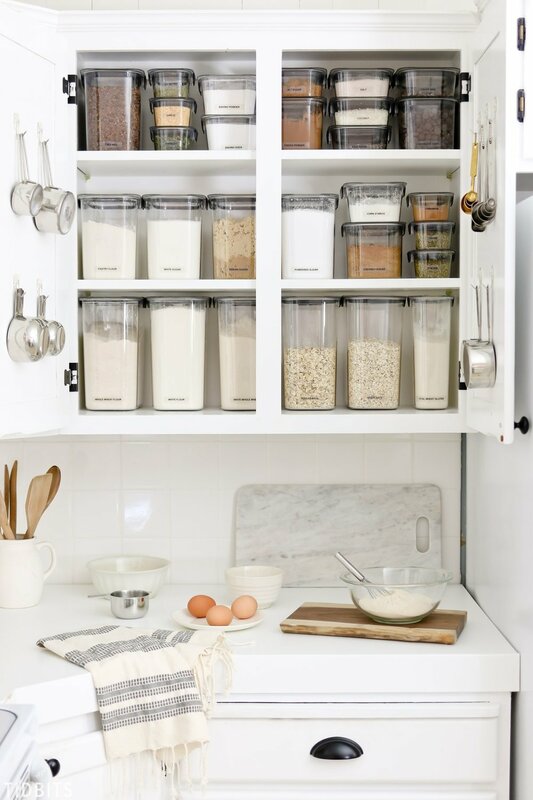 I love these simple jars with the sealed tops for organizing some of those most used baking goods!! I particularly like that these lids stay attached! Meaning there is no extra clutter on the counter as you pull these out to use them from one recipe to the next! 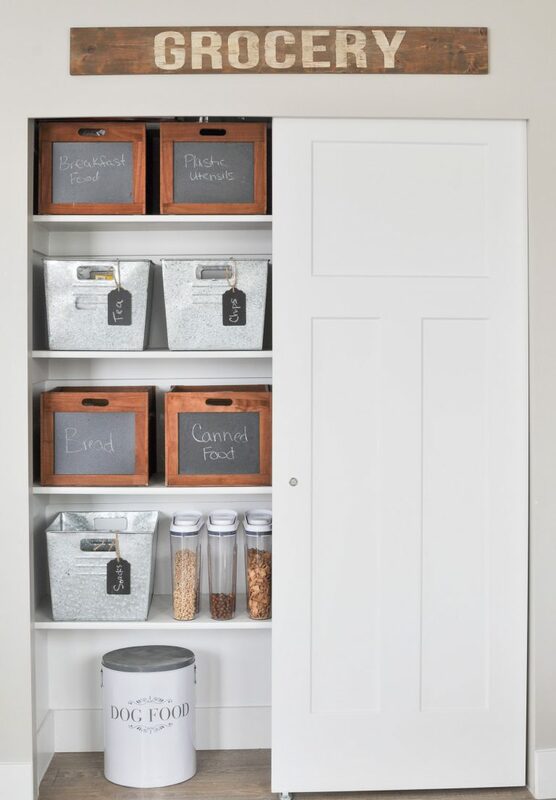 A simple white pantry with the goods out on display and black labels is the perfect combination for a well organized farmhouse style pantry! If you haven’t checked out Shannon’s remodeled kitchen RUN right now to go see it in all its glory!!! There are a million elements of this kitchen I adore but this little corner with the spices displayed so neatly is perhaps on of my most favorite elements to her beautiful and organized kitchen! Organizing spices can get a little tricky. My current drawer situation is not working out let me tell you! I love the idea of displaying them in a way that is not only pretty but functional as well! No needing to guess if your all out of oregano either one quick glance and you know if it needs to go on your grocery list! If the thought of organizing your children’s toys makes you want to give up before you even try Don’t worry you are not alone!!! I will admit fully that my kids toys is one of those items in our home I have yet to find the best solution for storage and organization. 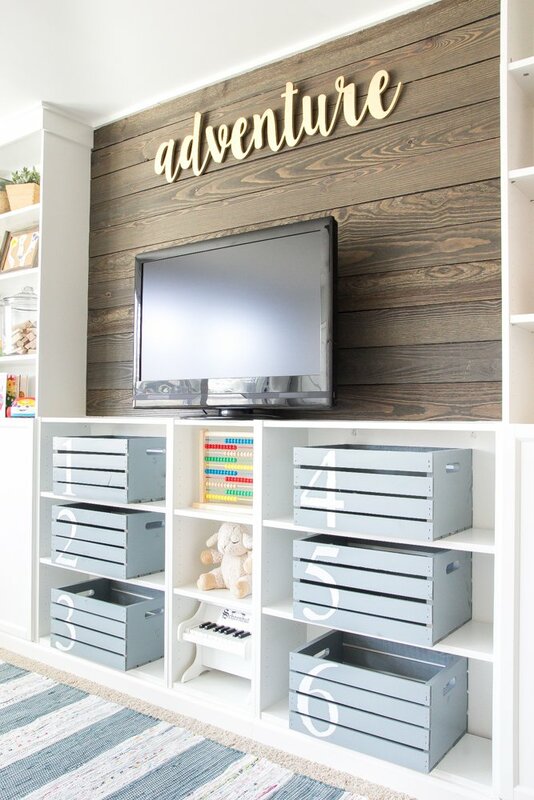 I love how Lauren from Blesser house has organized her entire play room but especially this wall! I have a set of destructive twin boys that are always testing my organizing bins life span! So far everything I’ve thrown their way has bit the dust, so I am eager to try out these crates like Lauren has used in her playroom! I think they might have a fighting chance to survive longer than a week! This is my laundry room in all its glory post makeover this past summer!! I tell ya this room was the bane of my house chores prior to its makeover! If you don’t believe me go take a look at the before linked above!! It was a HOT mess!! 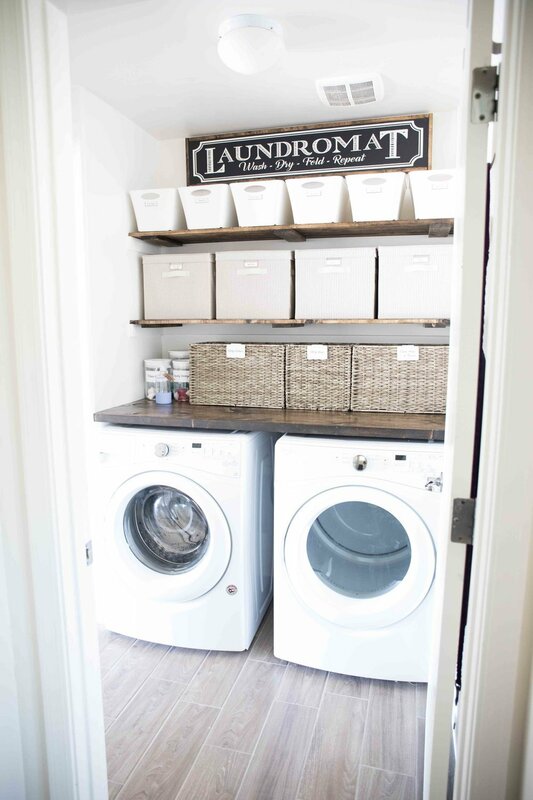 I have a pretty dinky laundry room which was easily the greatest challenge I had to tackle while trying to organize this space! It had an awkwardly placed shelf that didn’t provide enough storage for organization. Out it went and two new stained shelves went in its place!! its has been a full six months since I completed this makeover and I can 100% say this room look just like the picture still! 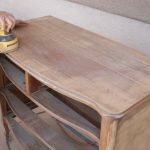 For me organization needs to be sustainable If I can not maintain the finished look for a long period of time than its a sure sign that the organization method is not working! They for my laundry room is that everything now has a designated place which I appreciate day after day! When my husband and I were first married we moved quite a lot the first few years! With each move my craft supplies grew and got more and more out of control! When we finally settled in our first home I knew it was time to do something permanent to tame the craft disaster that was at the time taking over our master bedroom closet! I shiplapped the wall and addes some stained shelves and some farmhouse style bins and baskets from amazon! this is another project completed that ive maintained for nearly a year now! and when I need a random bead, or ribbon I know exactly where they are organized! Baking this is is such a beautiful way to organize all those baking supplies!! I love the idea of having everything stored in the same place and easily accessable! Cami Tidbits did an amazing job making this baking organization look straight out of a magazine! and I can only imagine how wonderful it is to use when it comes time to whip up a batch of cookies!!! I currently have my baking supplies stuffed in 3 different corners of my kitchen I am certinaly taking notes and will be switching things up soon! Lastly we have these spice jar organization lables that I shared for free in the post above!!! 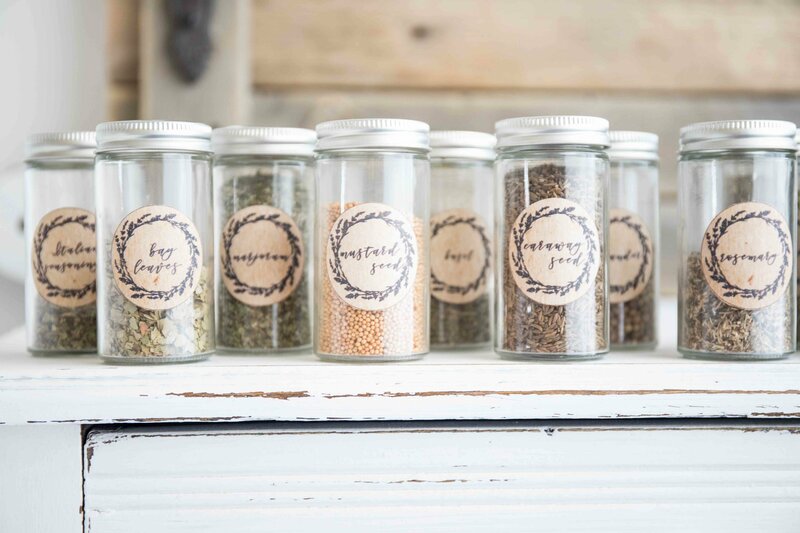 I wanted something simple but with that farmhouse style to help me label all of my spice jars uniformly!! I switched them out of their original containers making them look much more uniform!! I love the way they turned out and now the real challenge is to find a better place to keep them so they don’t keep rolling all over the drawer they are currently stored in!! You can download these free prints in the above linked post! I hope you have found these organization ideas for the home helpful and inspiring! I know that I certainly added some great ideas to my own to do list to tackle in various areas of my home!! be sure to pin the image below to save these ideas for later and thanks so very much for stopping by! !